Yesterday, Senate Majority Leader Mitch McConnell announced that the upper chamber's traditional August break would be severely limited this year. Democrats have lashed out at the decision, accusing McConnell of playing partisan hardball in an election year. They say he's scheming to keep them in session, rather than back home (and therefore off the campaign trail), during a challenging cycle in which numerous Democratic incumbents are defending vulnerable seats. One of the most vocal complainers on this front is Florida's Bill Nelson -- who must be forgetting the times he demanded that Republican Congressional leaders cancel or shorten recesses in order to focus on the people's business back in 2016, when he wasn't up for re-election. Funny, that. The previous six presidents' nominations (put forward during each man's first two years in office) faced 24 forced cloture votes combined. Trump is already at 101, with seven-plus months remaining in his second year. Every time the minority forces a cloture vote, filing that motion and carrying out that vote eats up time. Successful cloture votes can also trigger up to 30 hours of floor debate prior to final vote, another significant stalling tactic Democrats have abused to gum up the works and slow down not only Trump's legislative agenda, but also the installation of his own team and appointees. The reason Democrats have resorted to these obstructionist tactics is that they destroyed their previous Bush-era obstructionist tactics after Republicans used them against Obama. Relatedly, here's a history of Democrats' unilateral escalations in the confirmation wars, particularly as it applies to judges. The upshot is that due to their own expedient power grabs, Democrats are reduced to using the clock to stall the confirmation agenda, dragging out the process interminably, and deliberately precluding a functional and timely schedule. McConnell and Republicans have complained bitterly about this for months (retaliating in various ways along the road), and now they're taking action. As I said in my tweet, if Democrats insist on using the clock as a weapon, McConnell is exercising his authority to extend the clock. This will both allow the Senate to press forward with more tasks (by declining to surrender weeks of valuable time, as is customary) and, frankly, to punish Democratic intransigence. Having exploded their own hardball tactics, Democrats are left with this watered-down option. 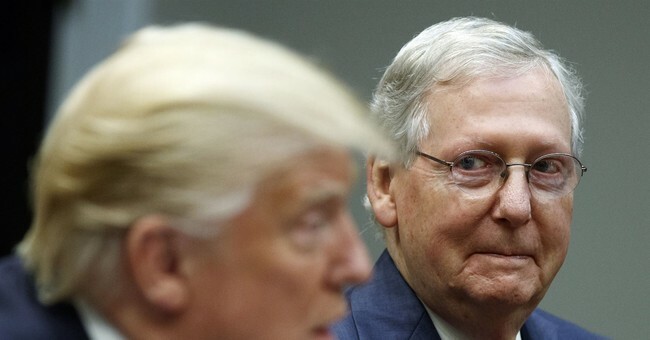 McConnell is throwing it right back at them. It's a wholly appropriate and deserved action, and it again underscores a reason that I believe McConnell is seriously under-appreciated among many conservatives: He's not afraid to stare down the opposition by forcing them to lie in the messy procedural bed they've made, and holding them to standards they'd only planned on applying to Republicans. He realizes the judicial stakes are uniquely high and acts as such. Democrat stalling led to the #Senate now taking its 101st cloture motion on a Trump nominee so far this Congress. Another delay.